While most engagement rings are crafted from yellow gold or platinum, silver engagement rings are a popular choice for their intricacy, delicate craftsmanship, and affordability. Before purchasing a silver ring, however, it is important to know how the metal compares to other options, and what special steps must be taken to keep it looking its best. Why Choose a Silver Engagement Ring? There are several reasons why couples choose silver engagement rings over more traditional gold or platinum rings. A bride's taste is one of the main considerations: if she prefers white jewelry that matches everything in her wardrobe, silver is a beautiful option. 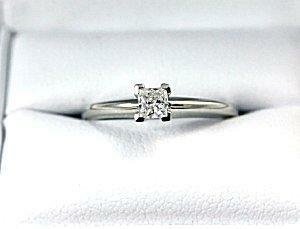 As for the ring itself, both design and cost factor into the choice of an engagement ring. Because silver is very soft and malleable, it is often used for fine detail work that requires elaborate shapes, such as filigrees, knots, or molds. The most intricate Celtic engagement rings are often made of silver because it can be easily shaped. Even many gold rings use silver embellishments for unique design elements, creating a two-toned ring with a great deal of visual interest. 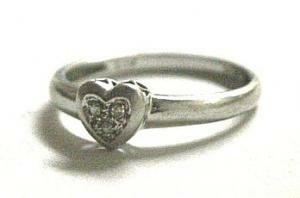 In general, silver rings are less expensive than their gold counterparts. Silver jewelry, however, is not priced solely based on the metal, but also on the intricacy of the piece and the labor required to produce it. Because of this, a very elaborate silver ring may have a higher price tag than a simple gold design. For those wanting a white metal ring and are on a tight budget, silver is much less expensive than white gold or platinum. Unique shapes and designs can be made from silver since it is softer and easier to work with than other fine metals. It is more common to find trendier pieces constructed from silver. Silver develops a patina over time that adds to the character of the piece. If you are planning to upgrade your ring in the near future, silver is a great option to consider as an initial piece. It also makes for a great everyday ring or for times when you do not want to wear your more expensive ring. Many people cannot tell the difference between silver and other white metals. Silver can tarnish and require more frequent cleanings than other white metals. Silver is more prone to corrosion over time no matter how well it is cared for. White gold is plated with rhodium and will need to be reapplied over time. Platinum is not plated with anything so will stay true in color. Silver is rarely used in its purest state for jewelry. Instead, sterling or copper alloys are used to add strength to the metal itself. If you have any known metal allergies, be sure to check the ring you are purchasing does not contain the metal you are allergic to. If the ring is silver plated, it can show wear over time and reveal the metal underneath the plating. Because silver is naturally soft, silver rings should be stored separately from other jewelry to prevent accidental scratches and nicks. As with any engagement ring, avoid wearing it while involved in heavy activity or cleaning that uses harsh chemicals such as ammonia or bleach, both of which can discolor even fine silver. Furthermore, silver can be damaged by seawater, so always remove a silver ring before swimming in the ocean, collecting sea shells, or simply spending time at the beach. The most common cleaning problem with silver rings is removing tarnish. Silver reacts naturally with sulfur and hydrogen sulfide in the air, and tarnishing is unavoidable. Wearing a silver ring continuously is the best way to avoid most tarnish buildup because the gentle friction from your fingers will keep the ring bright, but that will not prevent tarnish in delicate designs or along the surface of larger rings. To remove tarnish, use a specially formulated silver polish and a soft, lint-free cloth. Despite their versatility and beauty, engagement rings made of silver can be difficult to find. Fine jewelers will often have a limited supply of silver pieces, but any gold or platinum design can be reproduced as a silver ring if desired. Small, less expensive rings are often available in silver, though they are often called promise or commitment rings rather than actual engagement rings, and their designs are less elaborate and use smaller gemstones. Of course, custom rings can incorporate any precious metal, including silver. When choosing a jeweler, always inquire about their experience with silver rings because of the required specialized care and delicate nature of fine silver. Silver rings are an affordable alternative to white gold or platinum for many couples. Not only is silver less expensive, but it is very malleable and can be used to create delicate patterns and intricate designs in addition to classic, simple configurations. When choosing a silver ring, however, always consider the additional care necessary to keep the metal tarnish-free and as sparkling as the day it is first put on the woman's finger. With loving attention, a silver engagement ring will be just as treasured as a gold or platinum ring, and will last far past the silver anniversary.